Designed for you, built by Sand & Steel. We build workout plans of all types for all level athletes. 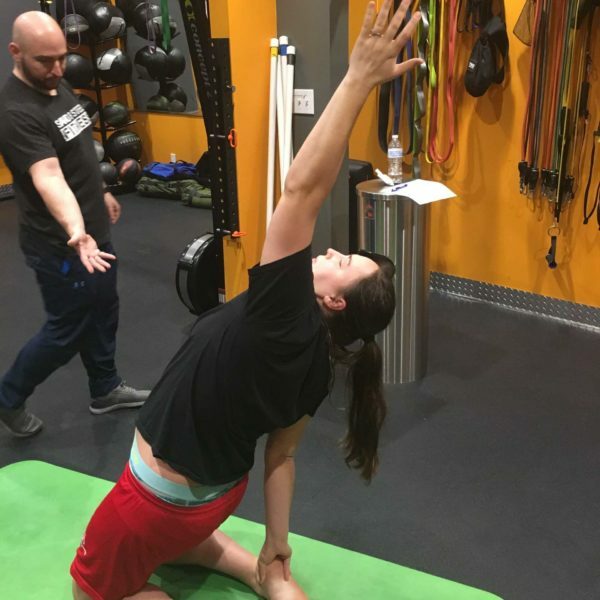 Strength, Weight Loss, Mobility, Flexibility, Yoga, etc. We build programs for people of all fitness levels, with injuries, for competitions, etc. No Monthly fees. One 30 Minute Phone Programming Consult is included with your purchase. Christina bought this item recently. You can choose whether to include the Fitness Assessment with your purchase. 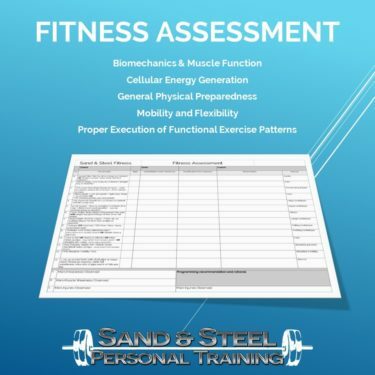 The Fitness Assessment provides greater customization. After you purchase your program, you will be sent a questionnaire that will allow us to build your program. You will specify frequency, difficulty, programming type, etc. Programs are designed for a month, but you may use them as long as you like. You purchase a new program, when you to upgrade your program, and/or change your program. One is included with your order. Additional checkins are $45 each and last 30 minutes. Facetime, Skype, or Google Docs is recommended. Can I view a Sample Program? Do you have Videos for the Exercises? Yes, we have over 900 exercise videos available on our Exercise Videos Page. Do I need to Come to Alexandria, VA? No, we can do the whole program remotely if you outside the Old Town / Washington DC area. 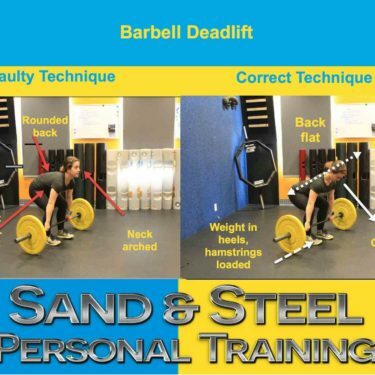 Do I need to Purchase a Program to Train at Sand & Steel? No, we provide programming as part of your personal training package. If you’d to take a copy of workout program home with you, then you’d buy this product. Or, if you want us to design you a home or travel program, etc., you might purchase this product. Template Program (Lowest Price): these are prebuilt programs based on the information you provide in your questionnaire. We have a database of 150 custom workout templates hand-built by us. Based on your intake form and/or Fitness Assessment, we’ll select the most appropriate program. Scaled Program (Best Value): we modify an existing template and scale the workouts in the program to you based on your intake form, and/or Fitness Assessment. Custom Program (Best Results): Built from scratch, these new programs are built specifically for you based on your intake and/or Fitness Assessment. We have many for questions on this product answered. We have been personalized Workout Programs for a very long time. Every question you can probably think of. 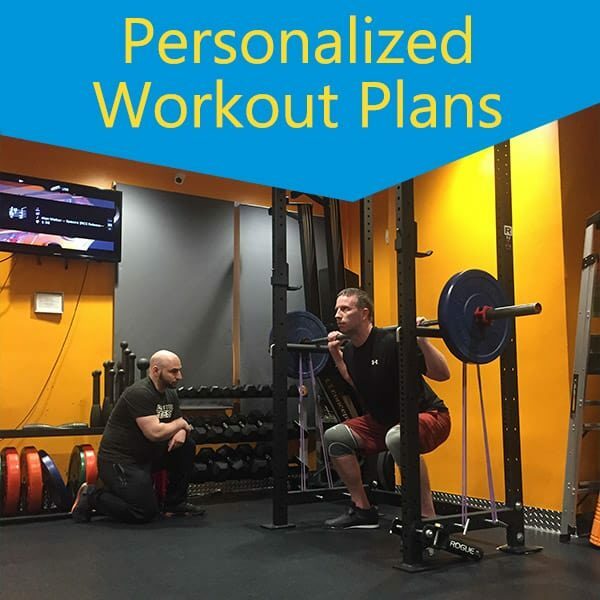 So here’s the full list of everything you want to know about our personalized workout plans. When we build clients a workout program, we factor in their goals, injuries, and fitness level. We build them a program based on current university research of time periods, tempos, rest periods, and duration that have clinical support for improvement. Moreover, as a gym we training about 10,000 client hours a year, and we write every single workout (yes, every single one.) We then hash the client improvement against their program to determine patterns, and use those patterns to improve the workout program. Our Exercise Library contains over 900 exercises with information on technique, scaling, faults, and advantages for the exercises in your program. What if I don’t have a Certain Piece of Equipment? We can provide assistance on substitutions. How Hard are these Workouts Supposed to be? That workout is designed to take a full hour. If you are phoning it in, the deadlift portion and heavy bag work might take 15 minutes. If you are really pushing the weight on the deadlift and putting in a 120% on the heavy bag work, it’ll take you more like 30 minutes. If you are encountering this problem, just leaves us a detailed comment on this post, and we’ll see where the issue is. Generally, we recommend mobilizing and warming up the areas that are toughest for the movement. For example, for deadlifts, one might warm-up the back, shoulders, and hips to help with positioning on the bottom of the lift. 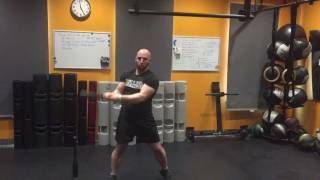 Here’s an example post on how to warm-up for squats. The number of warm-up sets depends on your level of mobility and the difficulty of the exercise. An exercise like a max benchpress might take 6-7 sets to warm-up to a maximum level. Similarly, one might need to pattern a complex movement like a muscle-up before attempting it in a workout. In general, these simpler and easier the exercise is for me, the fewer warm up sets I would do. Do I need to do a Cool Down? Cooldowns are a great opportunity to mobilize tight joints, spend time on fascial release and trigger points techniques. What if I am Really Sore after a Workout… Should I take off a Few Days? How Sore is Too Sore? Long story short, if you aren’t sure whether the pain you are feeling is too much pain, hire the best personal trainer in your area, and have them do a diagnostic training session with you. If you have been working out everyday for several consecutive, you might consider taking a deload week. Can I take a Deload Week? Yes, generally we recommend going easy on the first week, and “deloading” every 4th week. Deloading helps the body heal from minor injuries, helps reset your hormones, etc. It also helps prevent gym burnout. 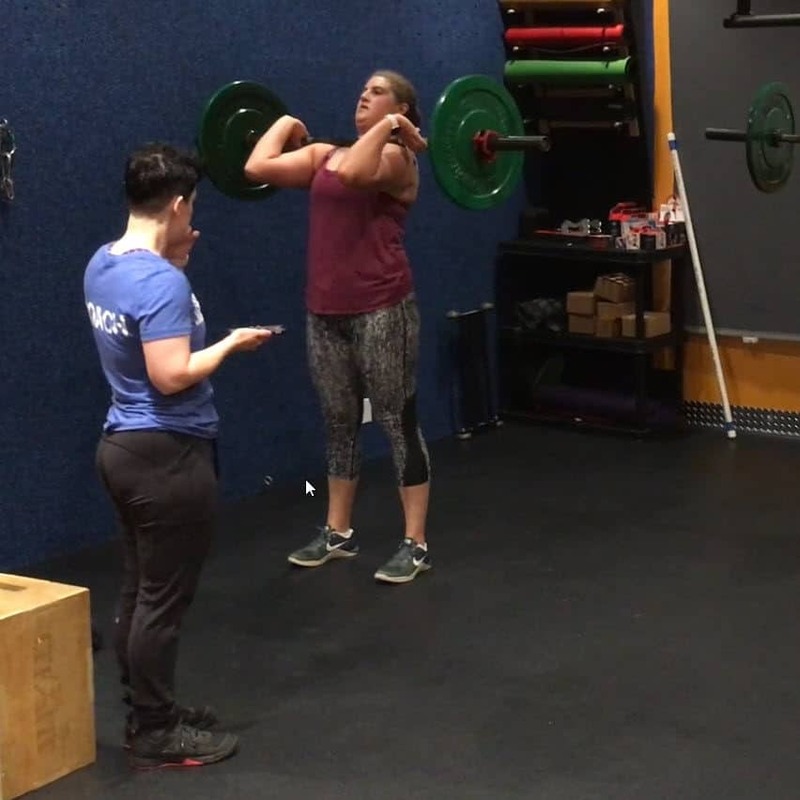 What if I don’t know my 1 Rep Max for a Particular Exercise? Computing a one-rep max from a 10 rep max will depend on the exercise. The computed one-rep max of a benchpress based on the 10 rep max is not the same as it for squats. Level of skill is important to consider. A novice lifter cannot safely do a one-rep max of many exercises. A computed one-rep-max will depend on the type of athlete. Endurance athletes have lower one rep max relative to their 10 rep max than endurance athletes. Injuries play a role in a computed one rep max. Write down how much lift as you go through the programs. If you don’t know a one-rep-max for a particular lift, estimate it (and write that down too.) You’ll likely find a unique correlation between your estimates of your ten rep max and your actual one rep max. With practice, you’ll quickly learn what your ORM is for all exercises. How Long Should the Rest Interval be? Generally, rest intervals are indicated on the workout itself. If not, if the exercise is a large compound exercise 2-3 minutes is good. The abbreviation NR means no rest. Often when we superset exercises, no rest is needed, because of the transition time. What about Workout Tempo and Negatives, etc? We use advanced timing techniques such as slow negatives, overloading, etc. for programs and athletes that need these types of variations to generate improvement. If your workout requires a 5-second pause squat than you’ll do a 5-second hold on the bottom. If no tempo is indicated, the exercise should be done at normal tempo. What do you Mean by Rounds? You’ll do 20 squats, 10 jumps, 10 pushups, and then repeat. Sequential lifts are the choice for strength training and power lifting. I Didn’t Set any New PR’s this Month… I feel like this isn’t working. Setting PR’s every month requires careful attention to choosing the right scaling of the exercise and the right accessories. This is very difficult to accomplish without personal training. That said, professional lifters don’t set PR’s every month. If you feel like you are plateauing, just let us know in your programming update questionnaire. Should I Take Every Set to Failure? No taking sets to failure tends to exhaust stabilizers needed for following exercises. In a strength program, I generally take the first and last exercise to failure. Yes, each set should burn in the last few reps, but taking all sets to failure tends to lead to bad form and injuries. Minimum 30 minutes with a maximum of two hours. Most people can finish a workout in 60 minutes if they are organized about it. 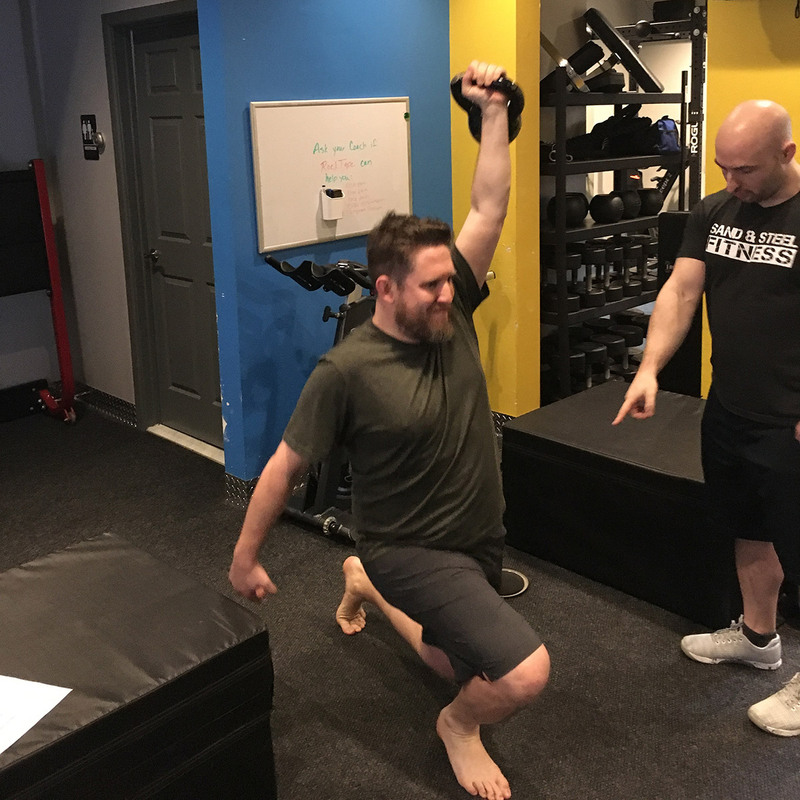 Most of the clients I train can finish their workouts in 40 minutes and we spend another 20 minutes working on mobility and flexibility. What if I need to Travel while I’m on my Personalized Workout Program? Sand & Steel has developed special travel workouts for when you are travelling. These include videos and infographics to help you learn the exercises. View the Travel Workouts article. Can I do Extra Exercises for my Favorite Body Parts? Typically, we build the programs around your favorite body parts as indicated in your Personal Workout Program questionnaire. You should have sufficient volume in your program to meet your development goals. If you must do more, we’d recommend you limit “extra” exercises to two exercises per workout. Is it OK if I Add in Extra Workouts Into my Personalized Workout Program? Your workout program with be a customized workout program based on the information provide in your intake form. If we thought it would benefit you to do more, we would put into your workout program. Adding in extra workouts will likely just interfere with the recovery cycles we build into your programming. If you are feeling like you aren’t getting enough volume or time “under-the-bar,” just explain as much in your follow-up intake form and we’ll address it. Can I Combine my Personalized Workout Program with Another Program? No. There isn’t a reason you need to do more than what we provide for you in your program. Our programs are calculated to your goals, more isn’t better. It’ll probably reduce your improvement. Can I Combine my Personalized Workout Program with Yoga, Pilates, CrossFit, Orange Theory, Running, etc? This answer is much more difficult to answer in general. The short answer is some extra workouts will interfere with your program, and some won’t. Extra workout routines should be carefully programming in. When you submit your intake form, you will indicate when you’ll be doing these “extra” activities, and we’ll adapt your Personal Workout Plan accordingly. Take off. Some many clients I train with think they need to workout 7 days a week. You don’t. Train 2-4 days a week, and go enjoy the other days outside the gym. I only work out 3-4 days a week. If you are determined to work on your fitness everyday, use the extra time for food shopping and meal prep. Still have extra time? Spend an hour or two working on mobility and flexibility. Factoring cardio around strength training is a big consideration. Many of clients don’t do any cardio because we include it in the workouts. If you are going to do cardio, 30 minutes after your workout usually generates the least complications. If you decide to do a 6 mile run the day after you do a heavy deadlift workout, it’ll likely interfere with your goals. Whereas doing sprint work will probably be OK.
How Much Weight am I Going to Lose per Month? Weight loss depends on so many factors. Yes, a good exercise program is important, but so are genetics, diet, rest, age, and your work environment. Additionally, people who have more weight to lose, lose more pounds per month than thinner people. Especially in a self-implement program, we really can’t estimate how much weight you’ll lose. Which Diet Should I Use? We sell a separate diet service called Origin Nutrition. You can download an ebook for free to check out some of the fundamentals of the program.